Peter Ellis was born on 1 August 1805 at Shaw's Brow (later renamed William Brown Street) in Liverpool. He was the third son in a family of seven; his parents were Peter Ellis Senior and Ann Ellis (née Appleton). Peter Ellis Senior was an architect who worked on the construction of Courts in an area now buried under Lime Street Station. It was perhaps no surprise when Peter followed in his father’s footsteps and became an architect. He was first mentioned in Gore's Liverpool Directory in 1834 as an architect with an office on Renshaw Street but prior to that he had learned his trade working with his father developing terrace properties for residential use. Ellis had a fairly prolific career and worked on many buildings in the Liverpool area in from the 1820s right up 1884, the year of his death. He died at the age of 79 at his home at 40 Falkner Square on 20 October 1884. Of all the buildings that he worked on he is best known for two of his commissions; Oriel Chambers built in 1864 and 16 Cook Street built in 1866. The Cook Street building had a spiral staircase, cantilevered out from the main building and clad with sheets of iron and glass. Oriel Chambers took its name from the type of windows used was in the construction. Oriel Chambers became Ellis’ most notable contribution to the architectural community in the United Kingdom and around the world. Oriel windows are a type of bay window that project from the main wall of a building but do not reach the ground. Oriel windows are supported by corbels, brackets or similar and are most commonly found projecting from an upper floor but have also been used on the ground floor. Designed and built by Ellis, Oriel Chambers contained the world’s first Paternoster-style lift. Ellis received a lot criticism from the architectural community for Oriel Chambers at the time of its construction and his career suffered a loss of momentum. 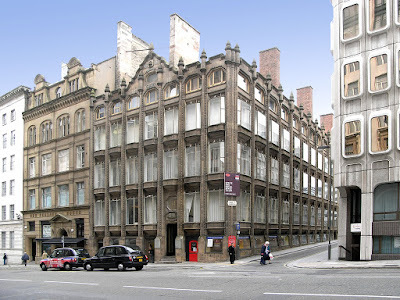 Many years later Oriel Chambers was praised for being one of the first office buildings to use an iron framework structure and oriel windows and Ellis was finally acknowledged as a pioneer. The innovative design has also been recognised as a precursor to Modernism and a source of inspiration for John Root’s early Chicago skyscrapers. From a vertical transportation perspective, Ellis is recognised as the Father of the Paternoster lift. Ellis had filed a patent* for a ‘continuously moving lift’ in 1866, it was granted the following year and the Paternoster lift at Oriel Chambers was installed in October 1869. Paternosters went onto become very popular during the first half of the 20th century, particularly in Eastern Europe. You can read more about paternosters in our post, ‘here’.